As a boy growing up in New Jersey, Mike Petronella used to sprawl out on the carpet and watch as a toy train his father bought him barreled down the track and toward his face, only to veer off suddenly as it navigated a curve and left him without a scratch. "It would never hit me," Mike said. What did hit Mike was the bug for toy trains. It was reinforced when a friend having a garage sale showed him some trains and then later when a conversation at a New Jersey train show led to an invitation to go as a guest to another meet - a gathering of the Eastern Division of the Train Collectors Association in York, Pa.
"The first time I walked into the building, my eyes were so amazed and my jaw dropped down to my feet," Mike said. "I was hooked. I was so hooked on that show that I joined the Train Collectors Association." Mr. Petronella received his membership card in 1996. Now, two decades later, he&apos;s been the Meet Chairman for the York show going on nine years. This year, he&apos;s hoping to help more people catch the train bug. If there&apos;s a place to do it, it&apos;s the York show, which Eastern TCA calls "The World&apos;s Greatest Train Meet." If you have never attended the York meet, guests are invited to the York Expo Center for this month&apos;s show, which runs from October 20-22. Guests can register at the door for $22 and attend the entire three-day event. Spouses are $2, and children younger than 18 are free with adult guests. Only single-width strollers are allowed. 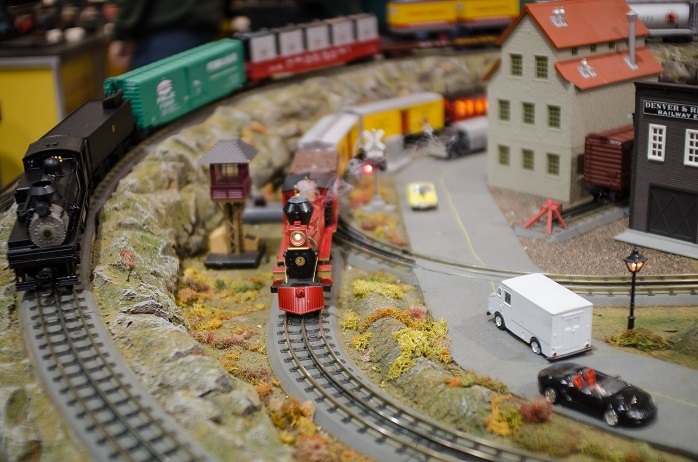 While some might be intimidated to take up a new affordable hobby, here are a few tips for people interested in diving into the world of toy trains at this month&apos;s show. "Once you get there, don&apos;t be in a hurry to buy. Look around," Mr. Petronella said. With over 2,000 tables and booths to see, the York train show is massive. It takes up six buildings at the York Expo Center and browsing them is a key to finding something you like. Wear comfortable shoes. Dealers are most likely to have new products, while members are likely to have a wide array of vintage items. All can be found at a reasonable price. It&apos;s like a wine tasting, Mr. Petronella said. Visitors should sample a bit of everything before taking a bottle - or in this case, a toy train - home. Starter sets, as the name suggests, come with everything you need for a basic train set. You&apos;ll get an engine, a few cars, a transformer and a track. It&apos;s enough to have train circling the Christmas tree this holiday season. You put the track together, plug it in, put the train on the track and you&apos;ve got a steam engine and happy railroading ahead. A higher-end starter set will come with more cars and engines that offer an array of functions, such as the ability to whistle, smoke and make sounds emulating squealing brakes and crew member conversations. Even if you don&apos;t buy anything during the October show, consider it your sneak peek for the April 2017 show. At that point, you may have a better idea of what you like and more confident in your purchases. The spring show will be open to the public, though access will be relegated to just the dealer halls. Now&apos;s the perfect opportunity to come and share in the excitement of the York Train Show. With all the sounds, sights, and smells it&apos;s guaranteed to delight your senses and get you ready for the holiday season. This just might lead to a lifetime hobby just like it did for the boy from New Jersey who loved watching the trains speed past his face.